Martin Weiss writes : In a couple of hours, I'll be flying home from Brazil. But before I leave, I want to give you a quick heads up about this new motor that's starting to revolutionize the world of autos, transform the markets for energy, and open up massive opportunities for investors. 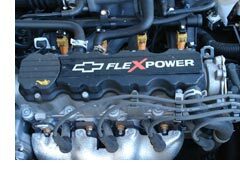 I'm talking about the flex-fuel engine. It senses the combustion pattern of the fuel — ethanol, gasoline or any mixture of the two — and automatically adjusts the piston speed accordingly. If it's ethanol, which burns more quickly, the pistons slow down. If it's gasoline, they speed up. But if you think this is just another expensive, experimental shot at an alternative car that's going nowhere, think again. The flex engine is already in 90% of all cars and light commercial vehicles sold here; and by next year, it will be almost impossible to find a new car without one. Toyota's new line of flex engine cars hits the showrooms next month. Brazil's VW has already announced it's ceasing production of all gas-only cars. And this flex-fuel revolution is not just about economy cars … but also sedans, SUVs and high-powered sports cars. 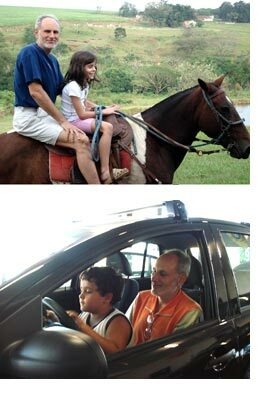 It's not just in Brazilian made Fiats, VWs and Toyotas … but also in Brazilian made Chevy's and GMs. Right now, Brazil's the world's most advanced country in flex-fuel engines and ethanol infrastructure. But sooner rather than later, other major industrial countries are also bound to catch on. Remember: The auto industry is global in all aspects. For Brazil's VW, Fiat and Toyota to share their flex-fuel technology with their home divisions in Europe and Japan is a no-brainer. Ditto for Brazil's GM division, which is already porting its flex-fuel technology back to the U.S. In fact, just a few days ago, with precisely that concept in mind, President Bush met with GM chief executive Rick Wagoner, Ford Motor's Alan Mulally and Chrysler's Tom LaSorda. He touted the benefits of flex-fuel vehicles. He urged Congress to move expeditiously on legislation mandating the consumption of 35 billion gallons of alternative fuels by 2017. And the Detroit execs committed to doubling production of flex fuel engines to reduce gas consumption by 20% in ten years. Also in Detroit, Chrysler has just unveiled a new 291 horsepower V-8 flex-fuel engine that gives customers the ability to use up to an 85% concentration of ethanol. The Chrysler Sebring Convertible is now available with a flex-fuel engine. And you can even get the hefty GM Silverado truck equipped with a flex-fuel V8 engine. In South Africa, Fiat's new flex-engine Uno was just unveiled at the Durban auto show. In the U.K., Swedish automaker Saab is turning competitors green with envy because its entire model line, including the flashy Saab 9-3 Convertible, is offered with its new "BioPower" flex-fuel engines. Industry experts say you'll soon even see flex-fuel engines in every NASCAR racing car. There are only two remaining obstacles: U.S. ethanol is made mostly from corn, which is far less efficient than the ethanol made from sugar cane in Brazil. And American consumers can rarely buy Brazilian ethanol because of import barriers. The Barriers to Ethanol Are Likely to Come Down Far More Swiftly Than Most People Now Believe Possible. Throughout history, superior, more efficient technology has inevitably broken down political and geographic barriers. And this situation is no different. Just last week, Brazil's president, Luiz Inácio Lula da Silva, met with President Bush to negotiate tariff reductions. Three weeks earlier, President Bush was here in São Paulo with Lula, signing onto a joint venture to export ethanol mills to Central American and the Caribbean, which, in turn, could export ethanol to the U.S.
And just this past Friday, came the truly big bombshell: The U.N.'s Intergovernmental Panel on Climate Change (IPCC), representing 2,500 of the world's scientists, shocked the world — again — with new, starker warnings of doomsday warming scenarios. Suddenly and with growing momentum, every country on the planet is starting to shift gears. Suddenly, everyone is searching for alternative fuels. And with equal speed, the U.S. representatives at IPCC, previously among the most resistant, are becoming one of the most aggressive in insisting on harsh global warming warnings — with the tacit backing of the Bush administration. Bottom line: Ethanol is coming to a gas station near you. Flex-engines will eventually be in every car in America. Our potentially fatal reliance on crude oil — especially from the Persian Gulf and from Venezuela — could be history. The name of our farm is Fazenda Milhã — not only a good-sized sugar cane plantation, but also a favorite resting stop in the Caminho do Sol , a popular trail for hikers from all over the world. The giant São Paulo metropolis is just 90 minutes away by car. Campinas, the state's second largest city with 3.2 million people, is 40 minutes. Just down the road is also the booming industrial city of Americana, a town founded by Confederate generals fleeing from the feared vengeance of the Union Army in the wake of their Civil War defeat. 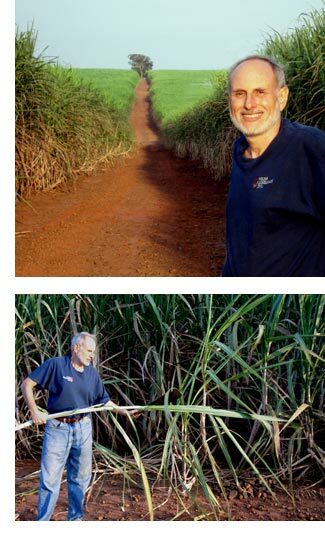 Overall, this is one of the most modern and prosperous sugar cane growing areas in the world; and now, with the surging demand for ethanol, it's becoming even more so. On just this farm alone, the harvest will be 20,000 tons this year; and just in this Central-South region of Brazil, about 472 million tons. Rolling hills, made bright green by the millions of cane leaves, stretch as far as the eye can see. The cane seems to grow like wildfire. It's easy to harvest, provided you know how. (Elisabeth says I don't.) And it's also easy to transform into ethanol. 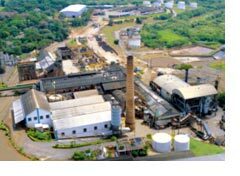 Within just a few miles from here, for example, there are five sugar mills making ethanol, with the biggest at the nearby town of Rafard. Sound like a brand new development? It's not. The Rafard mill, which churns out 550,000 liters of ethanol per day, was founded by the French 124 years ago, around the same time as the fleeing Civil War generals were building their homes in nearby Americana. And it's been producing ethanol for decades. The only things that have changed: The name (most Brazilians still call it alcohol) … the octane (much higher than gasoline's) … the efficiency of the technology (evolving rapidly) … and the quantities now being produced (huge). All told, Brazil has 350 mills that are currently making ethanol. And this year, total production should hit 19 billion liters. Rain in Brazil is scarcer. Our central pivots, which we bought to strictly irrigate potatoes, eggplants and legumes, is now needed for sugar cane. The water level of our reservoir, where I swim each day, is declining. And not long ago, Brazil suffered its first hurricane in recorded history. We're so shell-shocked, we still haven't figured out what to call it — "furacão" (hurricane) or "ciclone." And as always, our family's children have some of the more interesting ideas on how to fix the problem. Some, like little Clara, would probably prefer to go back to the horse and buggy. But most, like Arthur, prefer the ethanol solution, especially when he gets to help me test drive the new, sportier flex-engine models. And for good reason: Saab, the Swedish auto maker, reports that its new flex-fuel cars reduce fossil CO2 emissions by between 50% and 70%, compared to gasoline-powered cars. And other flex-fuel engines should soon be able to match that performance. Most important, ethanol is abundantly available at the pump. Everywhere. In fact, there's no such thing as a "gas station" in Brazil any more. They're fuel stations, giving equal access to gasoline AND ethanol. Remember the Esso stations we used to see everywhere when we were kids? Well, like elsewhere around the globe, Esso is still ExxonMobil's brand name in Brazil. And the Esso station we filled up at last week had more "alcool" (ethanol) pumps than gas pumps. Ditto for Shell stations and Petrobras stations. If They Can Do It in Brazil, They Can Do It in the United States! Period. That's true for the entire complex — from the fuel distribution systems to the manufacture of flex engines … from the biofuel fields to the biofuel pumps. The only thing still missing is the political will … and the investment dollars. But as you can see from the brewing buzz in Washington and Detroit, that's also changing quickly. For starters, I recommend just investing in Brazil as a whole. The flex-engine-and-ethanol boom alone justifies it. Plus, as I've been telling you frequently, we also see a boom in resources (exported in huge quantities to China and Japan) … a boom in aircraft manufacturing (the world's third largest) … and a continuing surge in Brazil's currency, the real, which just hit its highest level of the decade last week. The most convenient vehicle: EWZ, the easy-to-buy exchange-traded fund that's tied to Brazil's leading stock index, Bovespa. Look. Flex engines are just beginning to spread to the rest of the world. Ethanol is just at the very first stage of becoming a global commodity. And Brazil is the far-away leader in both technologies. So if you're not yet on board, you're certainly not too late. 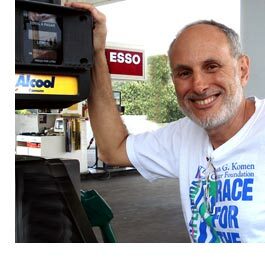 Ethanol is truly a fascinating concept and alternative to our current dependence on fuels. But in respects to its Stock, don’t bet all your corn on this one. Here is an article that explains the implications of buying Ethanol Stock. /www.whiskeyandgunpowder.com/Report/EthanolReport.html”> Why Ethanol Cannot Live Up to all the “Perfect” Energy-Solution Hype Read up, Invest Strong, & Enjoy…..Cheers! I read your article on Brazil and Ethanol with great interest. I am wondering if or indeed how, ethanol might be used in the airline industry. I don't have any knowledge in this field but I would be interested to know you thoughts.